India has been at the forefront of the solar industry for the past few years now. They are currently in the process of building by far the world’s largest solar power plant, and newly elected Prime Minister Norendra Modi has announced a plan to bring electricity to every home by 2017, using solar power. Now, India is taking another huge step in the development of their solar infrastructure. The idea of floating solar panels is not a new one. India already has a number of solar installations floating on canals across the country. And just last year, Japan opened up its new Kagoshima Nanatsujima plant, a floating solar plant consisting of 290,000 solar panels floating off the coast of Kagoshima, a city at the southernmost point of Japan. India’s new plant will be similar to the Japanese one, though slightly smaller. It will cover an area of 1.27 million square meters (about 0.5 square miles), and generate 50 MegaWatts of power. For comparison, Kagoshima, which generates 70 MWs, is able to power 22,000 homes with a little extra power left over (which goes back into the grid). Gon Choudhury, chairman of India’s Renewable Energy College, recently spoke with Gizmodo about the plans. He pointed out that the plant will have little environmental impact on the ecology of the body of water, and that the solar installation will also reduce evaporation, helping to conserve water during the hot summer. Choudhury says. India hopes to complete the project by the end of the year. Read the original story from Gizmodo here. 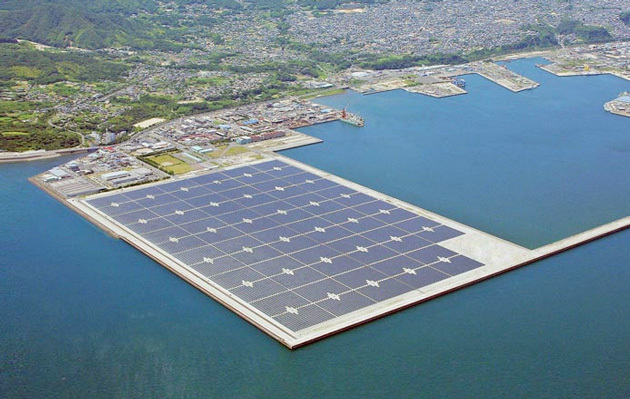 Note: The feature image is of a floating solar installation in Okegawa, Japan. On June 12, 2009, the International Space Station’s orbit happened to take it over the Kuril Islands (northeast Japan). The Kuril Islands were built by volcanic activity and still have active volcanoes. The most active is Sarychev Peak, located on the northwestern end of Matua Island. Although Sarychev Peak hadn’t erupted since 1989, it was somewhat overdue for one, considering it had previously erupted in 1986, 1976, 1954, and 1946. The images (which you can view frame by frame courtesy of NASA here) are remarkable for a number of reasons. 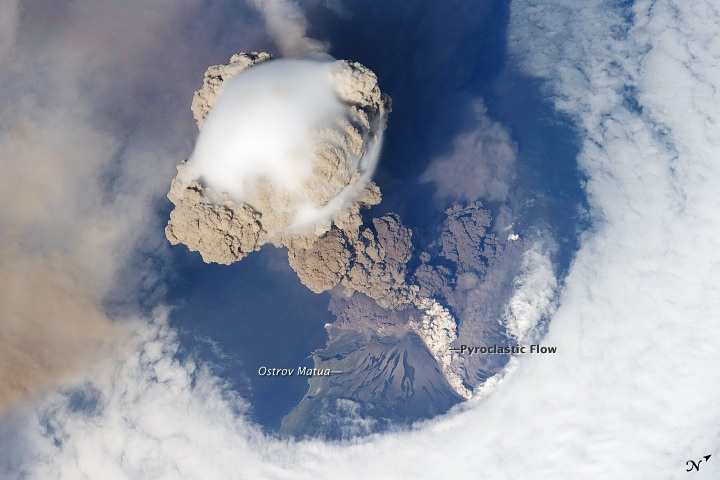 Firstly, there was little to no shearing wind to spread and disperse the ash plume, so the ISS was able to capture crucial features of the eruption, like the pyroclastic flow at the base. The small white cloud at the top of the ash plume is known as a pileus cloud. It was formed as the eruption rapidly pushed the moist air above the island upwards with the plume. As this moist air is pushed upwards, it cools and condenses, forming a cloud. When a pileus cloud in above an eruption or explosion, it’s called an “ice cap”. One of the coolest features of these images has actually caused a bit of controversy in the science world. If you look around the edges of the images, you will see that the ash plume is emerging from a large circular opening in the clouds. 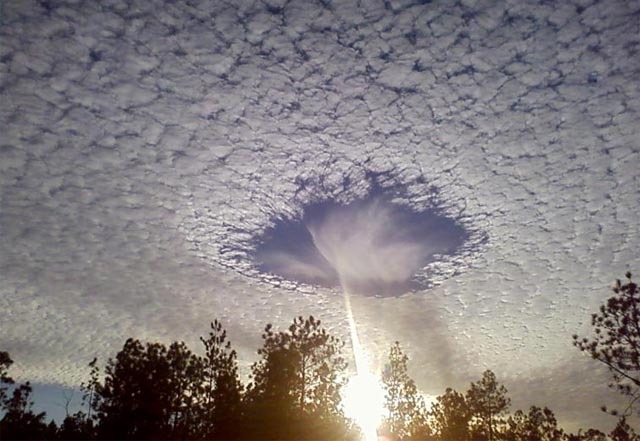 When the photo was originally published, NASA postulated that the hole was “punched” through the clouds by the upward shockwave of the eruption. But this explanation sparked a debate between meteorologists, geoscientists, and volcanologists who viewed the images. SInce then, two other possible theories have been proposed. One is that the hole has nothing to do with the eruption at all. In areas where islands are surrounded by oceans with cool surface temperature, it is very common for sheets of clouds to form and drift along with the low-level winds. When these clouds drift over an island, the moist air closer to the surface is pushed up by the island. Since the air above the marine layer (where the clouds form) is dryer and warmer than the air over the water, the portion of the cloud over the island evaporates, leaving a hole. The final theory is that as the ash plume rises, the air above it flows down its sides, like water flowing off the back of a surfacing whale. As this air falls, it tends to warm, which could also cause an evaporation of the clouds around the volcano plume. Whatever the reason, I think we can all agree that watching a volcano erupt from space is a truly mesmerizing site. Check out the original post from NASA’s Earth Observatory here. You may have never heard of stoats before. These cute little creatures are closely related to ferrets, which are becoming an increasingly popular house pet these days. But don’t let their innocent appearance fool you- stoats are ferocious hunters. And when their speed and agility isn’t enough, they have a strange but fascinating secret weapon: hypnotism. Stoats are very hardy creatures, and are able to live in all kinds of environments from the Siberian Arctic, to the mountains of Japan to the Great Plains of the United States. They can be found in Europe, North America, Asia and New Zealand. A large portion of a stoat’s development centers around play fighting, which builds up their strength and stamina and hones their agility. These fine-tuned skills allow them to take down some surprisingly challenging prey. The video below shows some of this play fighting, and also shows a stoat taking down a rabbit 10 times its size, using the hunting skills it perfected as an adolescent. 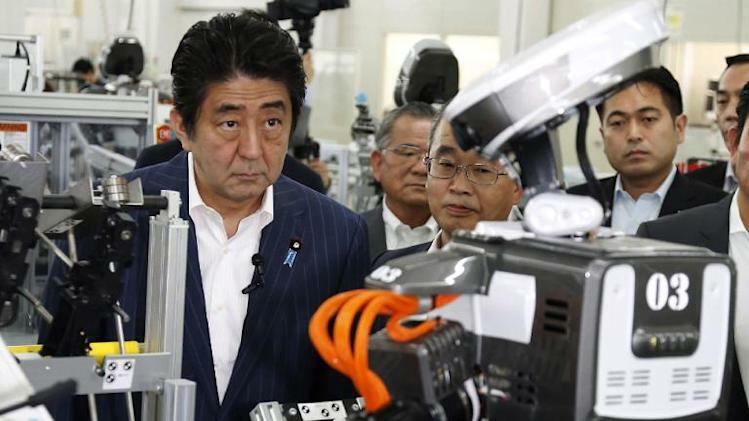 Japanese Prime Minister Shinzo Abe wants his country to be on the cutting edge of the robotics industry. During a recent visit to a number of Japanese factories that build robots for industrial and care-giving purposes, Abe revealed his plans to bring about a “robotic revolution” in Japan. These plans include tripling Japan’s robotics budget to 2.4 trillion yen (~$23.5 billion USD) to make robotics a “major pillar” of Japan’s economic growth in the future. Abe also revealed his intention to host the world’s first robotic olympics. he told reporters from Japan’s Jiji Press agency. Abe hopes that the robotics industry can help revitalize Japan’s economy, which has been stagnating under the pressures of deflation for decades now. He believes that robotics will be particularly important for Japan’s future because of the country’s aging population and declining workforce. Abe’s announcement comes during a time of major robot launches in Japan. One of these is a robotic suit which can be controlled just by thinking. It was designed by the company Cyberdyne. The suit picks up the weak electrical impulses that our brains send to our limbs when we start to move. The robot is then able to move perfectly in sync with that motion, providing extra strength and stability to the movement. It’s hoped that it will drastically improve the lives of people living with ailments that effect movement, like muscular dystrophy or serious arthritis. A humanoid robot, named “Pepper” was also revealed earlier this month, by major cell phone company SoftBank. Pepper’s creators claim the robot can understand human emotions as well as 70-80% of spontaneous conversation. The field of robotics is making huge advancements, maybe none more impressive than the robotic suit that allowed Juliano Pinto to kick-off the World Cup back on June 12. The suit was designed by the Walk Again Project, a project headed by Miguel Nicolelis, a Brazilian neuroscientist based at Duke University. Nicoleleis hopes the project will make relatively normal movement a real possibility for people left paralyzed by spinal injuries. Read the original story from the Telegraph here. Engineers from Japan set out to build the world’s best robotic soccer goalie and they just might have succeeded. The goalie has a built-in motion-sensing device and it can ball hawk like crazy. So what do you do when you design a functioning robotic goalkeeper that is surprisingly effective? Well after crushing all local competition, you challenge the world’s best soccer player to see just how good your machine really is! 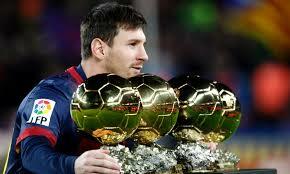 Lionel Messi has been arguably the world’s best soccer player for the last few years now. Just check out the picture of him below hanging out with his four FIFA player of the year awards. Messi, the star of Argentina’s national team and a starter for the world-renowned club FC Barcelona, was put to the test in a battle (hosted by a Japanese game show) against the robotic goalie. In the video you can see the Messi triumph over the robotic goalie, but only just barely. It took shots at speeds of up to 133km/hr (~83 mph) to even challenge the robotic goalie. The robotic goalie’s potential is far from maxed out. With a little tuning up by the Japanese engineers behind the project, like improving its reaction time and making its arms slightly longer, the robot could soon be unbeatable. 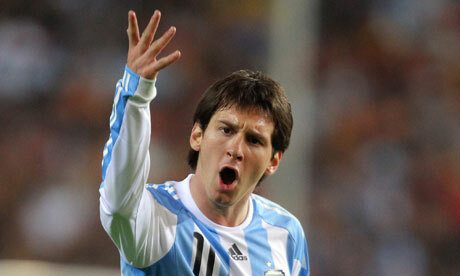 Sorry Messi, enjoy your small victory while you can. 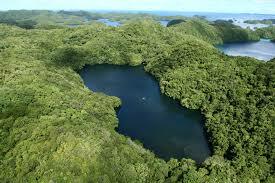 This small, picturesque lake is located on the remote island of Eli Malk. This island is part of over 200 small islands which make up the country of Palau, a small island nation located near Japan. Although the lake is connected through small underground tunnels to the ocean, the lake and its inhabitants are, for the most part, totally isolated. Eli Malk is part of the Rock Islands, a cluster of mostly uninhabited limestone and coral islands that contain about 70 marine lakes similar to Jellyfish Lake. Though many of these other lakes contain their own jellyfish, none of them have as high of a concentration of golden jellyfish as the lake on Eli Malk. Because of the extreme isolation, the golden jellyfish inside Jellyfish Lake have evolved into their own unique species over time. Many believe that other new species may have evolved from their relatives in nearby lagoons as well. Tsutomu Yamaguchi may very well have been both the luckiest and most unlucky man ever. On August 6, 1945, he was riding a small trolley across the city of Hiroshima. Yamaguchi recalls hearing the roar of an aircraft engine in the skies above during the ride, but thought nothing of it, since warplanes were constantly flying overhead during that time. What Yamaguchi didn’t know was that this was no Japanese plane- it was the U.S. Bomber the Enola Gay, preparing to drop a 13 kiloton uranium atom bomb on the city. Yamaguchi stepped off the tram at approximately 8:15 a.m. He looked up and saw the Enola Gay passing overhead. Then he saw two small parachutes (these chutes were attached to the warhead, though he couldn’t see the bomb itself). Yamaguchi was less than three kilometers away from the bomb when it detonated. The shock waves from the explosion ruptured his eardrums and the bright flash of light left him temporarily blinded. The heat from the warhead also seriously burned on the left side of his upper body. The last thing he remembers before passing out is seeing the mushroom cloud rising skyward. He eventually regained consciousness, and was able to crawl his way to an air raid shelter, where he spent the night. Upon arriving at the shelter, he found his three work colleagues who had also survived the blast. 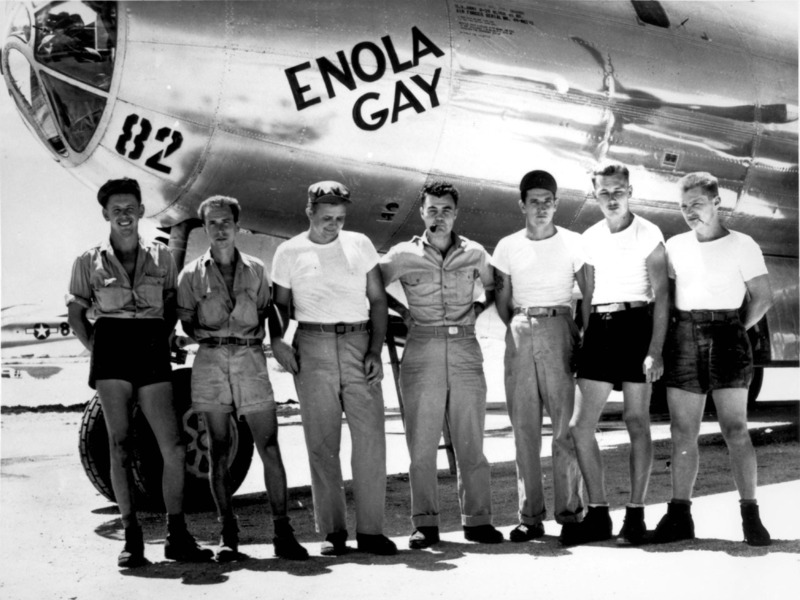 All four of them were engineers from Nagasaki who had just happened to be sent to Hiroshima for work that day. The next morning, Yamaguchi and his three colleagues left the shelter, wanting desperately to return home to try to make sense of what had just happened. On their way to the train station they passed horrific scenes of destruction, including countless charred and dying bodies. They finally reached the station, boarded the train, and made the 180 mile journey home to Nagasaki. Yamaguchi, who was in a pretty bad state upon returning home, had his wounds tended to and bandaged as soon as he arrived back in Nagasaki. According to Yamaguchi, it was at the exact moment that Sam asked this question (11:02 a.m.) that another blinding flash of light penetrated the room they were in: the second bomb had just been detonated in Nagasaki. 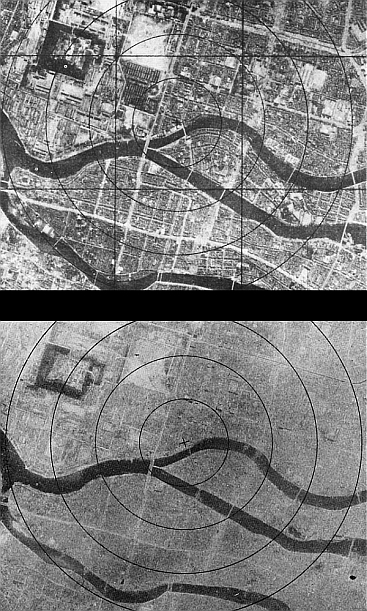 Though many people are unaware of this, the second bomb’s original target was the city of Kokura, but since Kokura was obscured by clouds that morning, the U.S. military switched the target city to Nagasaki. Miraculously, not only did Yamaguchi survive the second blast, but so did his wife and baby son. The family spent the next week or so in an air raid shelter not far from the ruins of their home. Yamaguchi was one of about 160 people who survived both blasts, but is the only one who was officially recognized by the Japanese government as an eniijuu hibakusha (double bomb survivor) in 2009, a year before his death. Yamaguchi finally succumbed to the radiation poisoning in his body in 2010, when he passed away from leukemia just two years after his wife died from liver and kidney cancer. He was 93 years old. Read more from the Surviving History blog here.